The Galaxy A series typically have their market debut around the turn of the year and the next additions will make no exception. 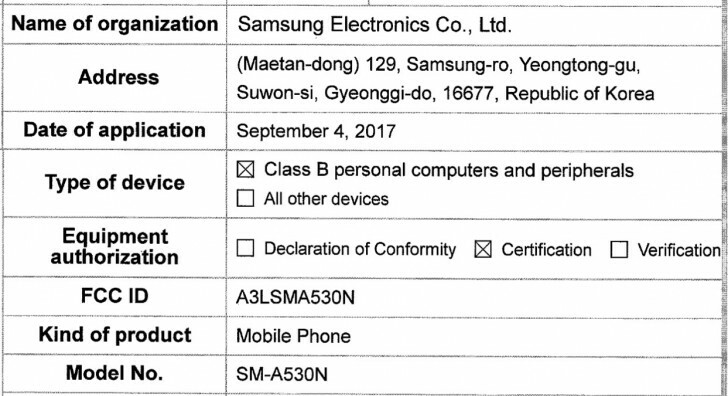 Among intensifying leaks, the Samsung Galaxy A5 (2018) has gone by the FCC to pick up its US sales license. The listing didn’t bring us any updates on the specs of the device, which has the model designation A530N, outside of its dual-band Wi-Fi support but that was always an easy guess. It also confirmed that the Galaxy A5 (2018) will have an e-label for its FCC-mandated disclaimers, which should help get rid of a few ugly icons on the back of the phone. Still, thanks to previous leaks we know the 2018 editions of the A-series handsets will come with taller 18.5:9 ratio displays to catch up to the flagship Galaxy S and Galaxy Note series. They will also feature rear-mounted fingerprint sensors, but they’ll be located under the camera, which seems more convenient than what the more premium series have. A benchmark listing that surfaced earlier confirmed the Samsung Galaxy A5 (2018) will be powered by the Exynos 7885 chipset with 4GB of RAM and a 5.5”	display of 1080 x 2160 pixel resolution. The A3 series and iPhones are in two different ends of the price range. A3 was more of a midranger. If it's a compact flagship you want, look at the XZ1 from Sony. Let's push a new model while ignoring the barely two year old models by not patching their blueborne and krack vulnerabilities. That's the Alpha you're talking about. get your facts right: LG Q6 Alpha: S435/2GB/16GB Normal LG Q6: S435/3GB/32GB LG Q6+: S435/4GB/64 GB. and the Alpha is not even offered in my country.